Today we welcome author Robin Talley for an interview! I’ve always loved writing. It’s not my only job, though ― in addition to writing fiction I work in online communications for a nonprofit women’s rights organization. That depends on the book, and what counts as “finished”! Could be anywhere from six months to three years. I usually start with a character or topic and the theme evolves naturally from there. My characters and topics often come from bits and pieces I read in news stories or hear about from people I know. Since I have a full-time day job, the bulk of my writing happens at night and on the weekends. Basically, any time I can get a couple of hours in, I’ll be writing. It’s pretty tough! I have to make sure I carve out enough time to write – which means that when I’m on deadline, I often have to say no to invitations to fun social things. My poor wife is often stuck going to parties without me. I think it’s all about the characters. If I’m reading about a complicated character with a fascinating voice who feels so real to me I’d recognize her if I saw her on the street, I’d be glad to read anything about her, even if it’s just a narrative of her loading and unloading the dishwasher all day. 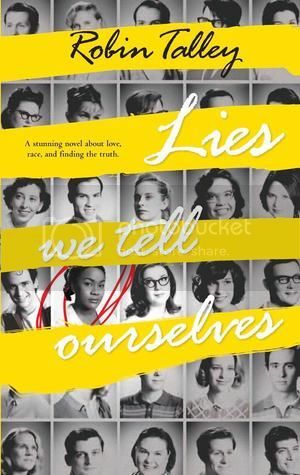 I’ve written five, and my favorite at the moment is Lies We Tell Ourselves, though I suspect that will change as I move through the editing process on others. My favorite in Lies We Tell Ourselves is Ruth, the younger sister of the main character, Sarah. She’s incredibly smart, brave, passionate ― so many things I admire. Usually in a tiny windowless room on the second floor of my house, with my cat sleeping on my feet. It’s quite nice actually. I don’t have anything close to the business and marketing skills required to self-publish, so for me it was an easy choice to go the traditional publishing route. Lies We Tell Ourselves is my first book, and my family is over the moon for me. They know I’ve always dreamed of having a book out. My parents sent me a picture they took on my release day of them standing in Barnes and Noble next to my book on the shelf. Both of them are grinning ear-to-ear. It was pretty cool. I love reading, of course! There’s also a lot of fun to be had in sitting with good friends sipping good wine. And when I get a chance to watch TV, my current obsession is The Americans. Don’t wait until you have a perfect idea ― just pick up a pen or open up your laptop and get started. Don’t be afraid to write something terrible, either. All first drafts are terrible. The first round of revision is when you make something terrible into something passable. On the second round, you might actually make it into something good. But you’ll never get there until you’ve gotten that first draft down. My favorite YA author is E. Lockhart, and although I love all her books, I always come back to The Boyfriend List series. I’d love to write characters as strong as hers and voices as compelling. I have several amazing writer friends who I will often ping for help with ideas and beg to read drafts when I’m stuck. My wife is also awesome at helping me work through problems. Yes! I’m revising my next book, tentatively titled Unbreakable, which will be out next fall. It follows a so-in-love-they-might-as-well-be-married high school couple ― Toni, who’s genderqueer, and Gretchen, who’s a lesbian ― who are being separated for the first time when they start their freshman year of college. It’s about the strains distance and finding yourself and can put on even the most rock-solid relationships. Thanks so much for stopping by today, Robin. It's been so great to have you here! Although the characters aren’t real, what kids went through during integration certainly is. Talley does an amazing job of giving voice to both sides the civil rights movement in the 1950’s, using the point of view of two strong, female characters. Chosen by the NAACP for their high marks in class and their potential, Sarah is among a handful of black students to be the first to attend Jefferson High – a previously all white school. Sarah, her little sister, and the other black students are met with violence and abuse the moment they step on to school grounds. The horrific things these children endured broke my heart. I kept hoping against hope that it would improve for them, knowing deep down that it wouldn’t. And it didn’t. Right away I loved Sarah for her strength and bravery as she walked the halls being spit on, ridiculed, and verbally and physically assaulted. Her poise and self-control when faced with horror after horror were admirable. As if this isn’t enough for any teenager to deal with; Sarah is gay and finds herself attracted to Linda, a popular white girl and the daughter of a well-known, outspoken segregationist. Sarah and Linda are paired together for a school project. Working in secret so that Linda’s father doesn’t find out, Sarah and Linda learn more about each other and themselves than they ever expected. Sarah’s quick wit and intelligence is a direct contradiction to everything Linda thought she knew about black people. Linda is everything that Sarah finds infuriating about white people. And their growing feelings towards each other adds more confusion and conflict. Lies We Tell Ourselves is a book that stays with you. It’s the kind of book that makes you look at little harder at yourself. It masterfully tackles some serious issues that, although we’ve come a long way, are still being dealt with today. Talley is clearly an experienced writer, able to trigger every emotion in her readers. I am wholly impressed. I grew up in Roanoke, Virginia, and escaped to Washington, D.C., at the first opportunity. I now live with my wife, our antisocial cat, and our goofy hound dog on Capitol Hill and work for a progressive nonprofit organization. I spend my nights and weekends writing young adult fiction about LGBT characters, reading books, and enjoying The Daenerys Show (you may know it as Game of Thrones). My first novel, Lies We Tell Ourselves, will be released Sept. 30, 2014, by Harlequin Teen. It's set in 1959 Virginia, and it's about a black girl who's one of the first to integrate an all-white high school, and the white girl with whom she ultimately falls in love. My next book, Unbreakable, follows a high school couple -- Gretchen, who identifies as a lesbian, and Toni, who identifies as genderqueer -- whose relationship is tested when they're separated for their first year of college. My website is at http://www.robintalley.com. You can reach me on Twitter at @robin_talley or by email at robintalley678 at gmail.com.